You can listen to 'Sweet Jesus' here. Having seen an announcement a while back that Aerosmith had a new record out, I did not imagine writing a review on it. And here I am. Old rockers never die and they rock hard as sixty somethings. Aerosmith is around for over 40 years. The first odd 17 years went straight past me. It was not a band that got a lot of attention over here. And then there was 'Rag doll' and not much later 'Walk this way' with Run DMC. It wasn't until 1993 that the band really broke over here, undoubtedly because of the great videos, but also because 'Get a grip' was at least for 50% a great album. After that the band slowly faded from my attention as the last studio album was from 2001, 'Just push play'. And then I heard Music from another dimension! Not unlike ZZ Top on its last album 'La futura' (click here for our review) Aerosmith seems to do just what it is good at. Write a good and dirty sounding rock song and embellish it with some horns or girls singing in the back ground. For the rest it's Aerosmith rocking hard and making it sound as good as possible. Steven Tyler and Joe Perry are a set of musical twins that can't go without each other. Not unlike Mick and Keith. So how much of the reported strive is real or PR, I leave others to speculate or write a good biography on. Tyler's performance is a mix of Jagger and Morrison, but his voice has that fine rasp that lends itself perfectly for rock. It may have some traces of all those years on the road, but is in fine form on the new cd. As always the list of collaborations where songwriting is concerned is a long one. Familiar names, Diane Warren, Marti Fredrickson, Desmond Child and Jim Vallence are all present, but the less familiar band members all have credits on this record. Even drummer Joey Kramer's son! 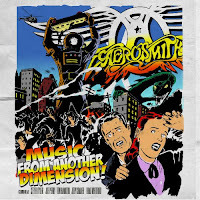 This all leads to a dynamic record that all in all was about six years in the making, an extremely long time, but Aerosmith can be happy with the result. Music from another dimension! is plain fun to listen to. And perhaps something of a wonder if I take in the extremely long period it took to conceive. Especially because it sounds like the band had fun. The back ground is extremely tight and in great form. Joey, Brad and Tom lay down a foundation that allows Joe Perry to strut his stuff. His characteristic playing is all over this record. A ballad like 'What could have been love' sounds a bit to forced in finding another 'Crazy' or 'Amazing'. Not that it's bad, but it doesn't spark like the ballads on 'Get a grip'. This could be a Joe Cocker song and may be a few years from now. Too neat and polished. On the other hand the rockers contrast better this way, so the song does have a good function as such. When the dirty guitars of 'Sweet Jesus' kicks in with the drums, I'm remembered that I'm listening to the right album. Especially when the tempo goes up. Riff away Mr. Perry! The duet between Tyler and Carrie Underwood in 'Can't stop loving you' is a lot more naturally flowing, so loads better. Aerosmith always holds this inner contrast in it, hard rocking and sweet U.S. like rock ballads. The only thing I can really find against the record is that it could have been two songs less in total, but, hey, I just start it at another point and that's fixed. So, all in all a great rock record by veteran rockers Aerosmith. It seems like they have a future, despite the fact that the band members may have forgotten that somewhere in the past ten years. Low down and dirty and produced well at the same time. What more can I ask for from a band that's around for 40 years?